ABT Studio Company in Ethan Stiefel's Overture. Photo: Kyle Froman. 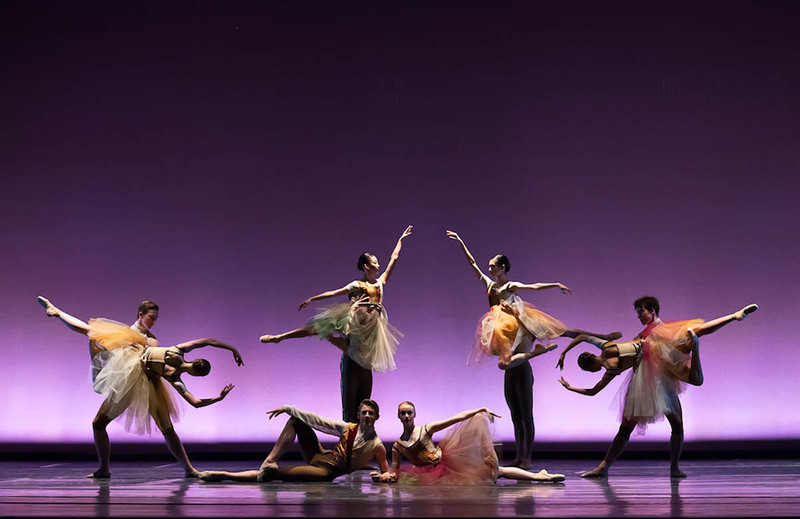 American Ballet Theatre Studio Company will appear at The Joyce Theater in New York City for three performances, Wednesday, April 24 at 7:30 PM, Thursday, April 25 and Saturday, April 27 at 8:00 PM. The ABT Studio Company performances will feature mixed programs of classical and new repertory, including George Balanchine’s Tarantella, Don Quixote Wedding Suite and an excerpt from Stanton Welch’s Clear. Five original works created on the Studio Company will be given their New York City premieres at The Joyce: Stefanie Batten Bland’s Pliant, Gemma Bond’s Interchangeable Text, Ma Cong’s On the First Star of the Night, Claudia Schreier’s Neon and Ethan Stiefel’s Overture. ABT Studio Company, directed by Sascha Radetsky, is a classical ensemble made up of 12 dancers of outstanding potential aged 16-20. As the highest level of the ABT training ladder, ABT Studio Company serves as a crucial bridge between ballet training and professional performance. Three quarters of the current dancers in American Ballet Theatre began their careers in ABT Studio Company, including eleven Soloists and nine Principal Dancers. ABT Studio Company dancers bring the artistry of American Ballet Theatre to a broad audience through domestic and international tours, choreographic residencies, cultural exchanges and local performances. ABT Studio Company performs masterworks from the classical and neoclassical canons, alongside new commissions. Choreographers who have developed new works on ABT Studio Company in recent years include Jessica Lang, Lauren Lovette, Benjamin Millepied and Liam Scarlett. Tickets for the ABT Studio Company performances, starting at $41, are available online or by phone at 212-242-0800. The Joyce is located at 175 8th Avenue in Manhattan, on the corner of West 19th Street.